Have you ever wondered how water can taste so different? The difference is simply in the process in which the water is treated. Water coming from a tap, a bottle or some filtration systems can make all the difference between crisp and refreshing to ordinary. If you’re a Sommelier serving quality wine to your customers, you need to ensure their palates are cleansed sufficiently to appreciate the taste. There’s various well-known ways of doing this, such as providing good quality white bread, plain crackers and encouraging them to swill their mouths with ambient water. Wine and food interact to impart different taste characteristics through one another, while water cleanses the palate to enhance the mingling traits of wine with a meal. As you’ll probably know, chilled water can numb the taste buds and many bottled waters and tap water have a high mineral and sodium content that can taint the taste of wine. So, making a good choice in which water to put on the table to ensure your wines are served with maximum flavour is essential. Vero Water could be the answer. We take pride in the fact that our water purification and bottling systems are used by world-renowned restaurants, hotels & conference centres. Our clients, as well as your guests, demand the highest quality water, which we work hard to deliver. Vero Water’s crisp, clean taste is possible thanks to our breakthrough Vero+ technology, which removes impurities, chemicals & imperfections, while delivering a perfectly refreshing taste you won’t find with ordinary filtered water. 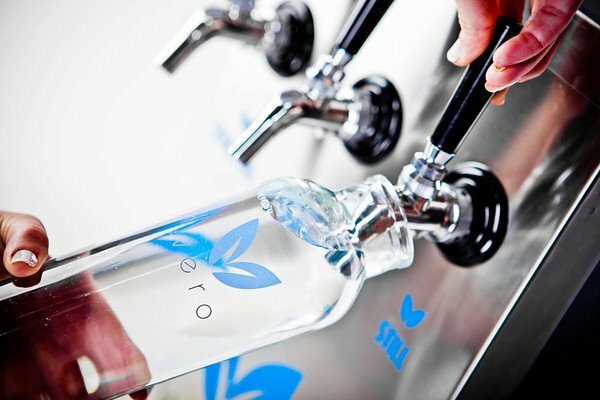 In addition to great tasting water, Vero Water has made it a point to focus on limiting the carbon footprint of its customers by providing eco-friendly water bottles that are dishwasher safe. Vero Water’s focus on limiting waste and other environmental friendly practices differentiates the company from all of its competitors. Now that is what’s called a difference you can taste! To demonstrate how suitable Vero Water is vs using ordinary tap or branded bottled water in your restaurant, why not take a free taste test? We’ll come to you and show you the difference it can make to your customer experience. Request a free taste test voucher and we’ll arrange a suitable date and time to visit you.